Student Experience with Digital and Public Humanities: a relatively new emphasis offered at the University of Wisconsin-Green Bay. For my last blog post as the Humanities Department Intern, I wanted to craft a post that delved into my Digital and Public Humanities (DPH) major. The purpose of this interview is to present information about the DPH emphasis. The questions asked in this interview are from the perspective of students who are interested in the major, want to learn more about what it is, and wish to know how it may be beneficial to them. The most effective way to illustrate my choice of majors is by giving examples of projects, research, and opportunities that I have encountered throughout my studies. This semester marked the beginning of my junior year here at UW-Green Bay, and I have a number of interesting and mind-expanding classes in history, the humanities, and the arts under my belt. This fall semester, I took my first Digital and Public Humanities course, “Hum Stud 200: Introduction to the Digital and Public Humanities,” otherwise known as the “Packers Class.” In this course, students were introduced to some of the basic skills foundational to the DPH major. A large part of the course was dedicated to learning HTML (Hypertext Markup Langauge), which is the first step in understanding the language necessary for creating web pages and applications. The Packers class was a combined class between the Intro Digital and Public Humanities students and the Craft of History (HIST 290) students. Brent Hensel, the curator of the Packer Hall of Fame, co-taught this class with Professors Heidi Sherman and John Shelton. 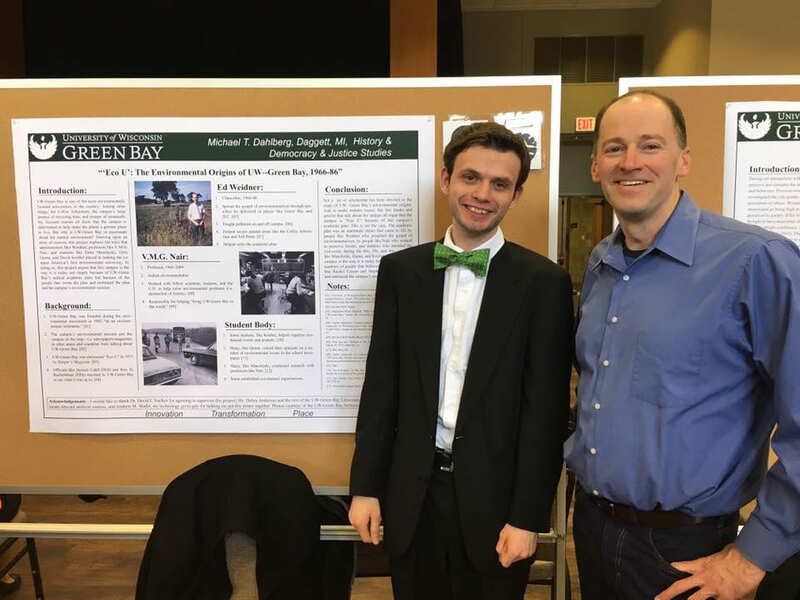 The overarching project of the semester was a collaboration project with both history and DPH students to create an interactive WordPress site that explored the history of the early years of the Packers. This year, the Packers are celebrating 100 seasons, dating back to 1919. We explored and researched the early history of the Packers organization, and the students created very impressive digital projects. There was a variety of different subjects, ranging from the evolution of the forward pass, civil rights in relation to the Packers organization, how the Great Depression affected the Packers, amongst others. At the end of the semester, our class had the exciting opportunity to present our projects and research at Lambeau Field. The Digital and Public Humanities students’ basic and fundamental knowledge of technology was put to practice in the creation of the WordPress sites. All of the skills we learned at the beginning of the semester were tested and practiced in the creation of my group’s website. The group that I was in completed our research project on Lyle Lahey’s Packer Cartoons. Our argument was that political and sports cartoons are portals to history. Lyle Lahey was a political and sports cartoon artist that published a variety of different cartoons from 1968 until his death in 2013. For our project, we analyzed and conceptualized a variety of different Lahey cartoons that focused on topics such as Coach Vince Lombardi and Dan Devine, as well as Labor Strikes in the NFL during the 1970s. My favorite part of our project was creating the interactive pieces that were used on our website. For each Packer theme we discussed, I created a presentation using the software Canva that included the Lahey cartoons we were analyzing and researching. The purpose of these presentations was to show the viewer what key aspects of the cartoon that caught our attention and developed our research. Through our website, we presented Lahey’s cartoons in an interactive way enabling the viewer to take part in our analysis and history. With each page, the viewer is able to make their own conclusions about Lahey’s illustrations while being provided with the necessary historical context. I am immensely proud of what we all crafted, and I am glad that Lahey’s cartoons may be viewed with as much enthusiasm and appreciation as we had. Throughout this class, I not only learned digital basics, but I also gained digital competencies, which has enabled me to think critically about how to use digital platforms for communication, preservation, presentation, design, and analysis. In conclusion, when my family and friends need clarification on what exactly is Digital and Public Humanities, I have issues giving them a concise definition. To me, the Digital and Public Humanities can embody many different definitions depending on who you ask. I would define Digital and Public Humanities as an interdisciplinary field that uses various forms of media to excite and engage the public audiences about culture, language, the world of history, and the humanities. Digital and Public Humanities students learn how to use different technological tools and methods in order to serve the public. It entails critical thinking, artistic design, and research while engaging with technology appropriately. This emerging field and new emphasis is interdisciplinary and integrates conversations on different platforms. The Digital and Public Humanities have the potential to tear down the long-established “ivory tower” of the Humanities and creates a public platform of relevance and accessibility for anyone. 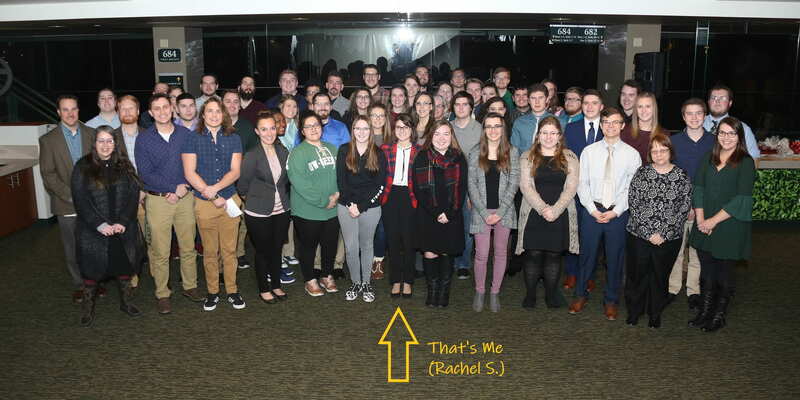 Rachel Scray, Humanities Intern Fall 2018. 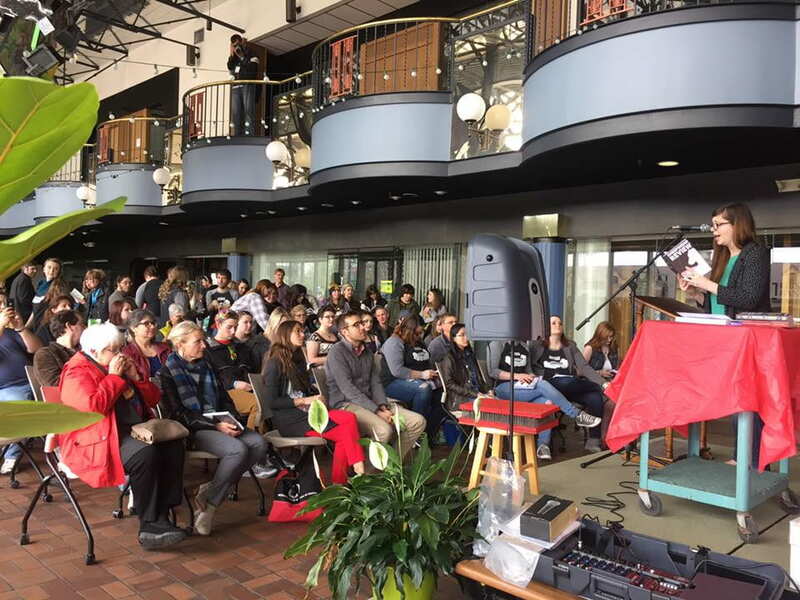 On October 17th, the University of Wisconsin-Green Bay had their first ever Phoenix Studios LIVE event at the Fort Howard Hall. 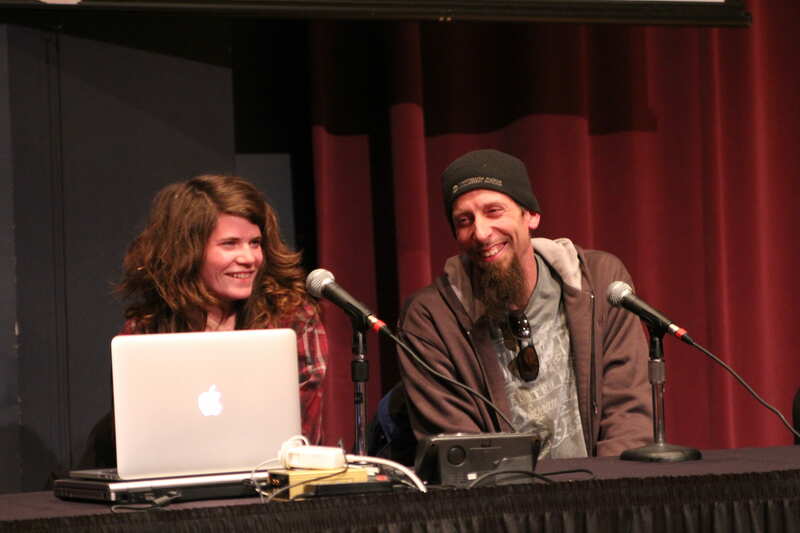 The event organized by the brilliant Phoenix Studios Producer Kate Farley was a fantastic showcase of the great podcasts that are produced here at UWGB. The hosts and masterminds of the night were Kate Farley and her Production Assistant and intern from the Communications department, Ntxhee Yee Thao. 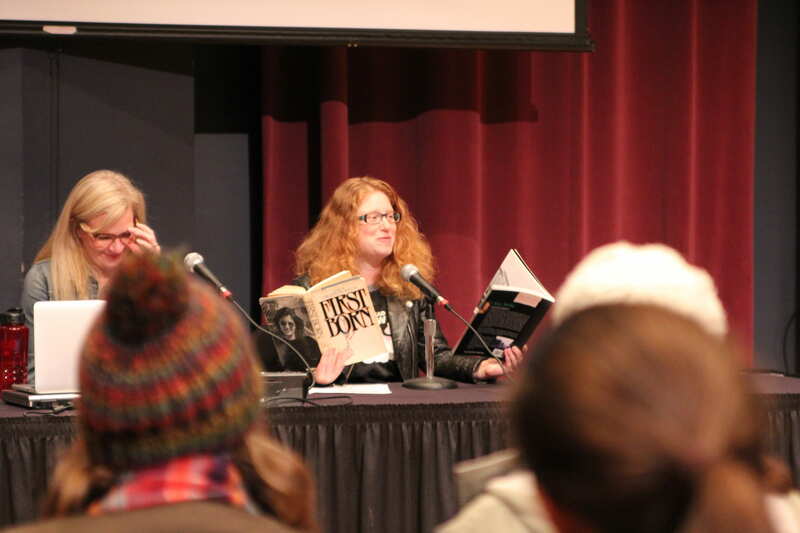 Phoenix Studios LIVE was a night of exciting and fascinating conversations focused on engaging topics that related to Mary Shelley’s Frankenstein and horror. The night started with a discussion on “Mob Creation” with hosts of ALL THE RAGE, Dr. Ryan Martin of the Psychology Department and Dr. Chuck Rybak of English and Humanities who is Dean of the College of Arts, Humanities, and Social Sciences. During this podcast, the two discussed what qualities define a “mob”, and how that compares to our common conception of what a mob is (you know, grab your torch and pitchforks, etc.). They cited real-life examples from day to day occurrences and joked about how they themselves could be defined as a two-person mob. Second on the night’s roster was the podcast, Indented. Hosted by Krynn Hanold, the English Creatives Intern, Dr. Rebecca Nesvet of the English, Humanities, and Woman & Gender Studies, and Dr. Jessica Van Slooten of the English department and Women’s Gender Studies Program Co-chair from the UW-Green Bay, Manitowoc Campus. During their segment, they discussed the daring and impressive life of Mary Shelley, a woman well ahead of her time. During the podcast, Dr. Nesvet illustrated an impressive skill that Wollstonecraft Shelley had learned from her father: reading two books at one time. This task was believed to be the best way to compare two books. Dr. Nesvet also passionately discussed how well educated MWS was during a time where women normally didn’t receive an extensive literary education. As a woman who was ahead of her time, MWS discussed topics of gender roles in a subtle and profound way through her work. Dr. Van Slooten discussed how MWS used gender to defy the values of the 19th century and the expectations of men and women in society. Drawing from Dr. Van Slooten’s expertise in gender studies, she breaks down the gender conceptions that MWS depicts in her writing of Frankenstein. 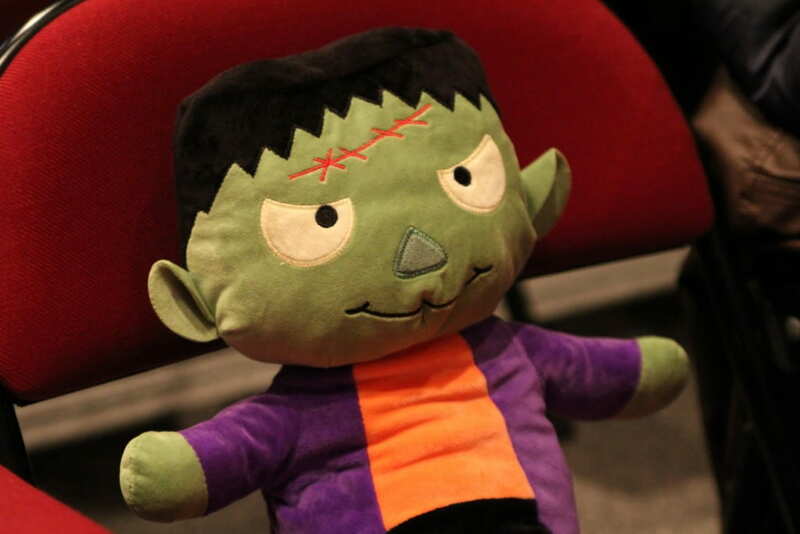 So who is Frankenstein’s monster, and does our vision of him parallel with MWS’ writing? The podcast, SERIOUS FUN! 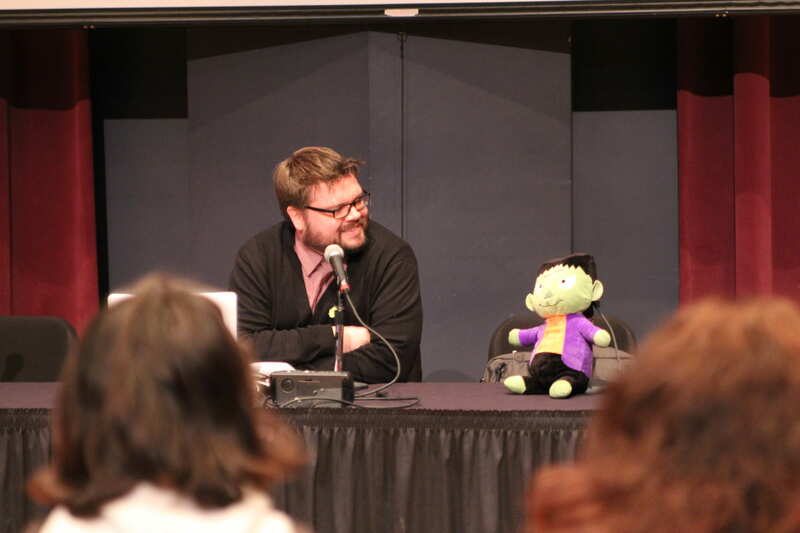 hosted by Dr. Carr with his special guest Bob the stuffed ‘creature’, takes on the topic of legal rights in relation to the image of Frankenstein’s monster. During this interactive podcast, the audience was asked to draw the image that pops into their head when thinking of Frankenstein. Naturally, the audience drew the typical creature (bolts in the neck, flat top head, scar on the forehead, etc.) created by Dr. Frankenstein and not Dr. Frankenstein himself. The image we think of as Frankenstein was first proposed by James Whale’s interpretation of the creature in his 1931 adaptation of Frankenstein. Carr delved deeper in the matter to explain the timeline of the copyright of the images of Frankenstein and discusses why and how we have many of different versions of Frankenstein today. The night ended on the topic of horror movies, specifically why people enjoy them. 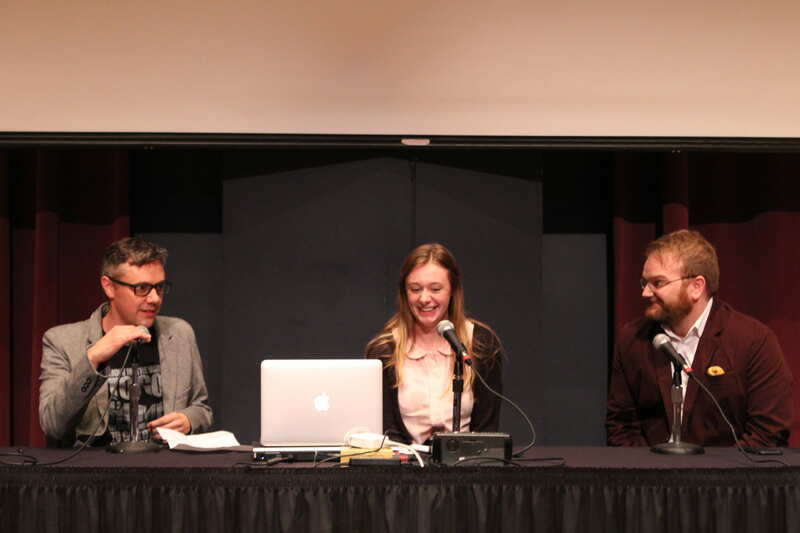 The podcast Psychology and Stuff was hosted by senior Psychology student Sammy Alger-Feser, Dr. Jason Cowell of the Psychology and Human Development departments, and Dr. Ryan Martin of the Psychology department. The panel was perfectly weighted with Sammy who is a horror film fanatic, Dr. Martin who just might consider watching a scary movie (given that the film has good qualities), and Dr. Cowell, who is not a fan. Throughout the discussion, they brought up their own personal experiences with horror and went on to explain the psychological processes behind their reactions to this type of film. 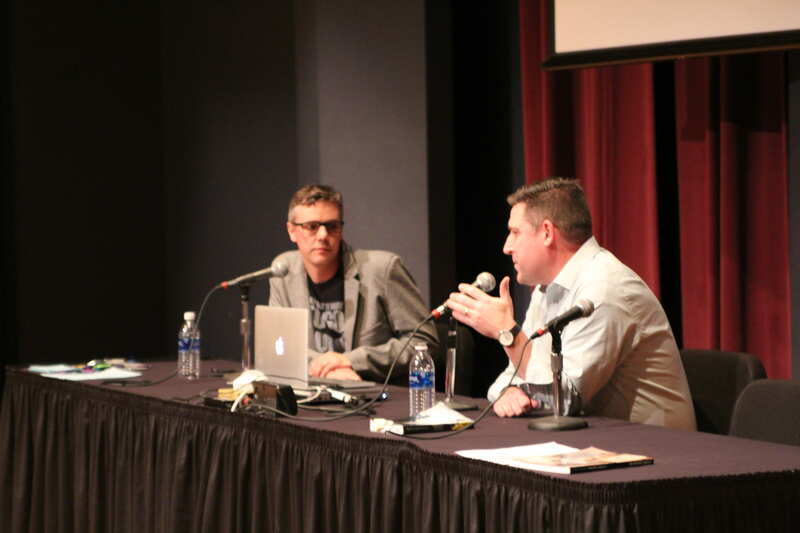 It is impossible to summarize every aspect of the thrilling topics that were discussed throughout the night. Even though each of these podcasts has different foundations in their disciplines, they all found creative and festive ways to incorporate their topics into a fluid overall theme. Phoenix Studios LIVE was a great event to showcase the variety of podcasts that UWGB produces. This night was also an excellent representation of the ways UWGB professors, students, and technical staff have created a common platform for the different departments and areas of study. 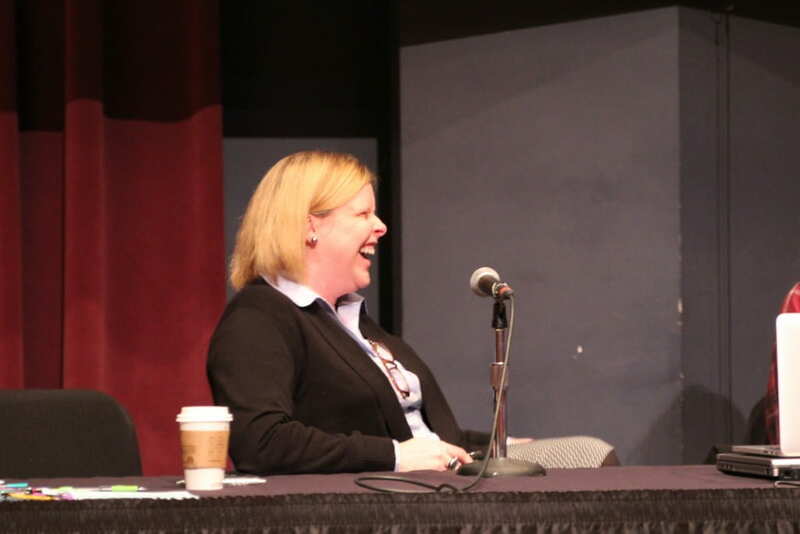 Through this event, the podcasts were able to reach a broader audience and showcase their individual focus, quirks, and personalities. We are very excited to see what Phoenix Studios has in store for us next. If you are interested in hearing the recordings from this event, each podcast will be posting their individual segments from the night and you can find them by clicking here. Photo Credit: Haley Falcon – Thank you for capturing the night. “Environmental Humanities” is a new minor emphasis in the Humanities. Starting last year, UWGB offers a minor in Humanities, with an emphasis on environmental topics. In addition to including interdisciplinary Humanities classes, the program also includes courses from English, First Nations Studies, History, and Philosophy. We often think of environmental problems as scientific and technical problems, so when we think about sustainability, we usually turn to scientific and technical solutions. While science and technology are clearly critical to both understanding and solving our environmental problems, they are two pieces of a larger puzzle. After all, since the 1960s (at least), we’ve had a growing scientific understanding of several environmental crises that are underway, including problems with pollution, deforestation, declining biodiversity, and climate change. During the same period, technologies for renewable energy, energy efficiency, and other environmentally friendly measures have expanded tremendously. Yet, arguably, the overall global environment is more degraded than ever before in human history. What gives? To understand what’s going on, we clearly need a perspective that includes history, culture, and ethics. That’s where the Environmental Humanities come in! The study of History can give us insight into how and why current environmental problems developed over a long period of time and across vast distances on Earth–and can also help us understand and evaluate how effective various efforts of reform and regulation have been over the years. First Nations Studies allows us to consider perspectives on the relationship between humans and (the rest of nature) that depend more on respect and reciprocity than on control and consumption. What would it mean, as Potawatomi botanist Robin Wall Kimmerer has asked, to “Reclaim the Honorable Harvest”? Last but not least, Philosophy helps us think in a complex way about the ethical issues involved in our relationships with the natural environment. What’s the moral significance of a tree or of a disappearing species? Do we have obligations to the environment that go beyond human needs? What do we owe future generations? Taken together, these humanistic disciplines empower us to ask crucial, big questions, including: When we talk about sustainability, what exactly is it that we are trying to sustain? Click here for more information about the Environmental Humanities program at UWGB, or feel free to contact me for questions. There are a couple of other courses that may be substituted for requirements, so please do check in with me or with the Humanities adviser, Professor Heidi Sherman. UW-Green Bay offers a variety of internships for students to take part in. Humanities interns are able to get internships at local museums, libraries, and more! The last post of the Spring 2018 semester features the next Humanities Department Intern, Rachel Scray who interned throughout the semester for the Hazelwood Historical Home Museum! Click the link below to read about her experience! 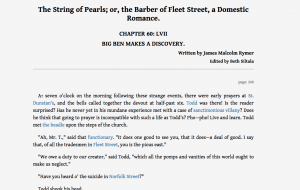 Many of us are familiar with Sweeney Todd: The Demon Barber of Fleet Street. What most of us don’t know, is this story derives from the 1800s in the form of a penny blood, a “Victorian fiction serial targeting working-class family readers.” Professor Rebecca Nesvet, who specializes in British literature, found a digital facsimile of one of two copies of the compiled versions of The String of Pearls uploaded to the Internet Archive. “I am Beth Siltala, and I am an editor of the Sweeney Todd Project. The project is a large-scale and long-term. There are about 170 chapters in this printed work, and we currently are only at chapter 60. I have been editing chapters and creating well researched annotations for about three semesters now under the guidance of Dr. Rebecca Nesvet at UW-Green Bay. 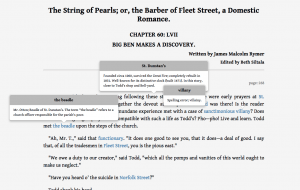 I first started this project in a class for my Digital and Public Humanities major, learning Extensible Markup Language (XML) and the Text Encoding Initiative (TEI). 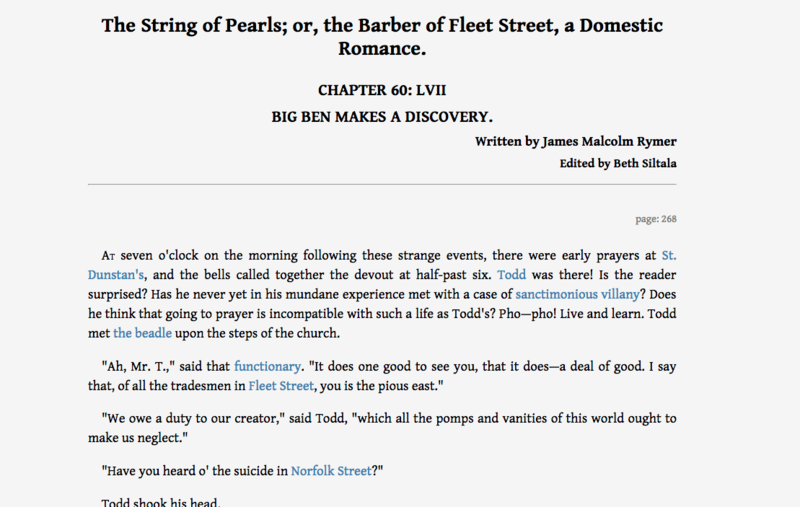 We were assigned chapters to edit, and then publicly post them on http://www.salisburysquare.com/TSOP/. 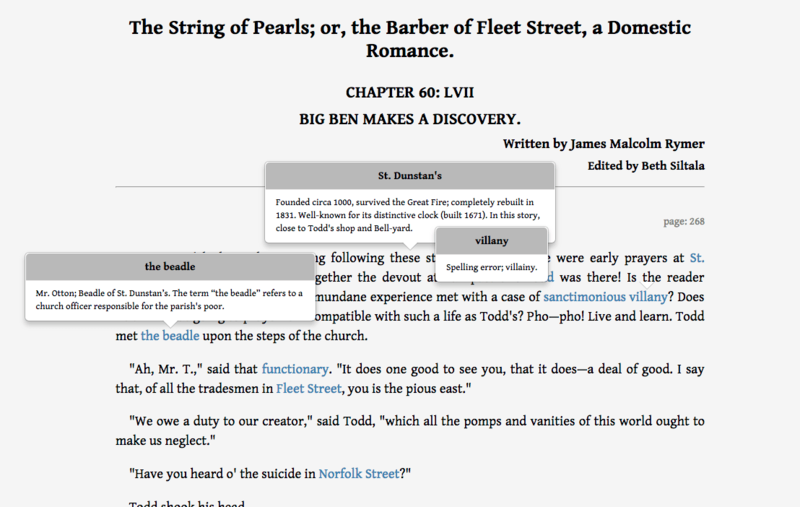 You can do a lot when annotating a text, like make it very educational or humorous. It just really depends on what the editor wants the readers to get out of the text. Sometimes, in the original text there are moments when the printers make spelling errors, so the job of an editor is to go in and note where the spelling errors are for the publication of the digital edition, notifying the public that this is not an error as this is what was printed. I think the reason why I have been doing this project for three semesters now is because I enjoy doing it. It certainly is not like anything I have ever done before (not in high school or my first couple years at UWGB). I also love the story, so I wanted to be a part of it for a longer time than just one semester. I continued my involvement on the project for the next couple semesters. For my second semester on this project, I became a senior editor for the project in one class, helping junior editors (and Dr. Nesvet teach) with their chapters and coding. Many of the junior editors were shocked that I had only been working on this project for two semesters (at the time I was a senior editor). They were, however, grateful for the knowledge that I gave to them during the semester. Now, in my third semester (Spring 2018) I am an intern for this project. I am proofreading earlier chapters that were published at the early stages of the project. Plus, I am coding chapters to be published on the site. On April 20th, myself, Emma Ferron (another intern in the project), and Dr. Nesvet are going to present our project in the UW System Symposium for Undergraduate Research, Scholarly and Creative Activity. Not only is it to show the UW System what we are doing, but also to show our skills to the public. With this, we can show people what we are doing and why this project is such a big deal to the digital world. History Club members playing Timeline. UWGB states it as such, “The humanities comprise those fields that study human creations of all sorts.” I think this definition is more accurate and representative of the study of the humanities. What is the study of literature, for example, without history or language and vice versa? The humanities as a field of study is truly a beautiful thing in that it spans across almost all fields and has real world, modern applications. 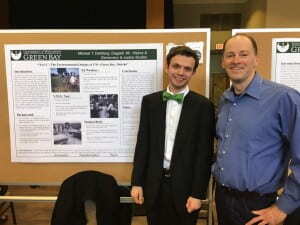 Student Michael Dahlberg presented his research on the origins of UWGB’s Eco-friendly reputation with Professor David Voelker at the Academic Excellence Symposium in April 2017. One can see that evidenced at UWGB. The Ancient and Medieval Humanities Club teamed up with the History Club and Engineering Club to build and launch a catapult. 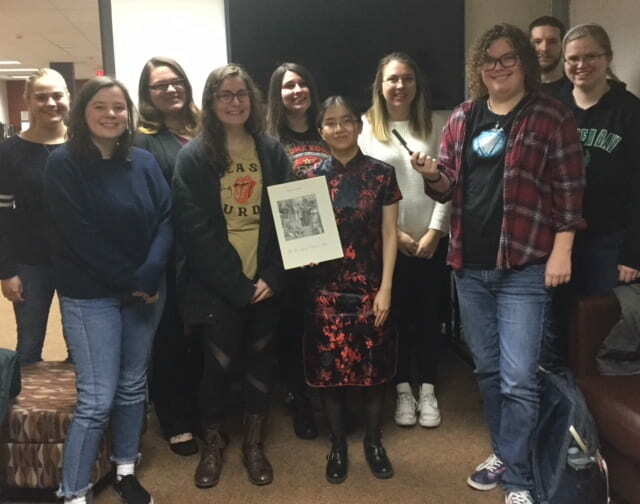 The English Honor Society, Sigma Tau Delta, hosts biweekly book discussions on fascinating titles such as Coraline by Neil Gaiman. Professor Stefan Hall hosts mead and beer brewing events. You can watch foreign films or brush up your French, German or Spanish with fellow students and professors. 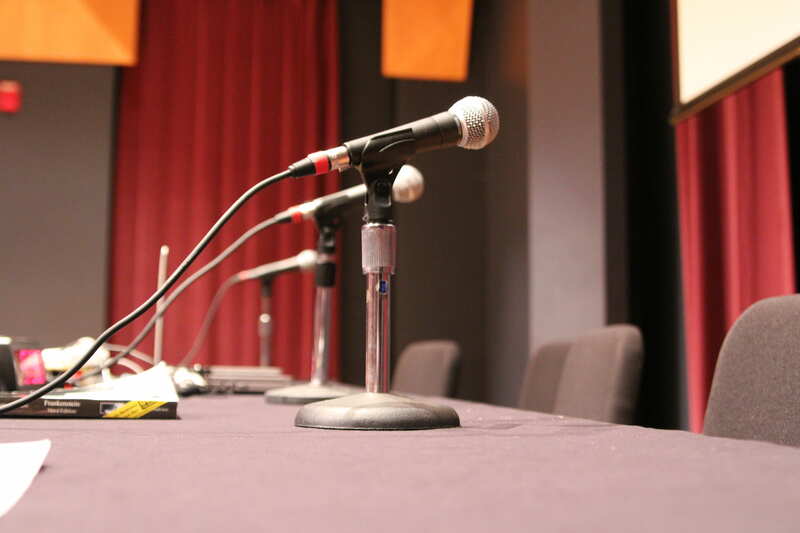 You can listen and contribute to discussions on a wide range of topics alongside community members downtown. Or watch your professors get into heated philosophical debates from the Reformation while personifying Luther and Erasmus. If exploring ways to apply your study of humanities to career fields is your interest, you can do an internship and find yourself doing any number of things, from teaching English to people from all over the world, to shadowing a lawyer in court, to learning how to introduce school kids to snakes at the Neville Public Museum’s reptile exhibit. You can even spend the summer venturing abroad to explore World War I trenches in France, Germany, and Belgium. There are so many opportunities to get involved with the Humanities program and the programs it relates to! The first annual Untitledtown Book and Author Festival began with the Sheepshead Review launch party. When I began my academic career here in Fall 2014, the History Club was starting up again. I worked in the Archives and Area Research Center which at the time was beginning to digitize their collections. Now there’s a Viking House on campus! 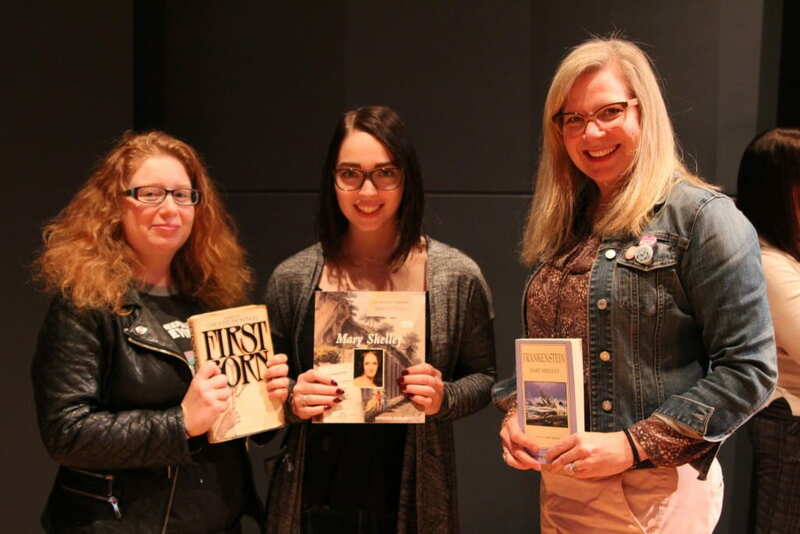 The English department started UntitledTown, an annual book and author festival! Even the programs name changed from “Humanistic Studies” to “Humanities,” since this program and its disciplinary programs are all fields within the Humanities as well as this title being more widely recognizable. 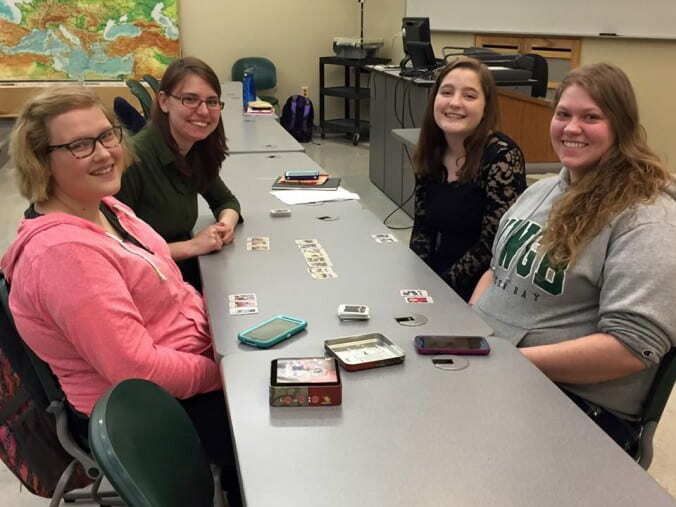 To sum, the Humanities are blossoming at UWGB, pulling in more curious students and preparing them for a future of excitement, creativity, and wonder! Recently I had the opportunity to sit-in on a lecture of Dr. Rebecca Nesvet’s for her class “The English Novel: 1850’s to the Present.” The reason why this lecture was particularly interesting was because it covered the topic of binary knitting, or knitting code – an idea of two very different disciplines fusing together. Professor Alison Gates, Chair of the Arts program and well-versed in the world of textiles, assisted in the lecture by discussing her knowledge about different types of knitting around the world and the commonalities between knitting and writing codes. A way that this can be done is by simply using a pattern between knitting and purling. We have all heard a variation of the phrase “Knit one, purl two.” When it comes to knitting a code, it isn’t very different than using a pattern of ones and zeroes as we would for computer coding. Even more interesting that this strategy was discovered long before the first computer. 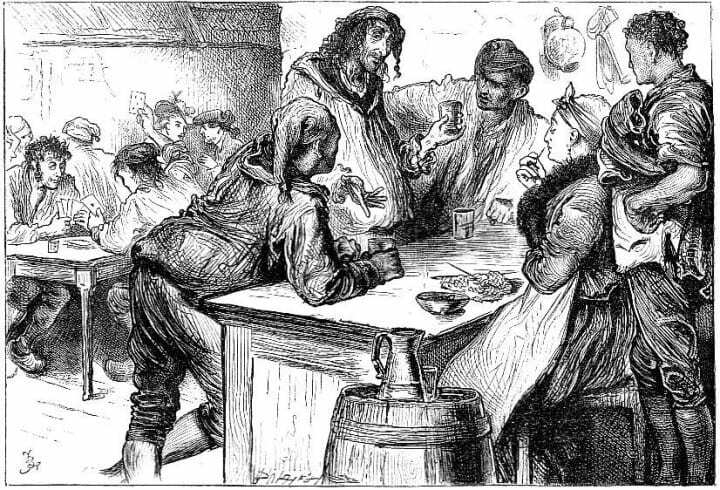 How this ties together with Dr. Nesvet’s English Novels class is in the interest of Madame Defarge in Charles Dickens’ A Tale of Two Cities. Madame Defarge was introduced as the wife of a shopkeeper, knitting in the corner, as that was a common activity for women of that time period to be doing. What was not immediately prevelant, however, was the fact that she was knitting code. As if the idea of an old woman knitting a secret cipher was not interesting enough, the message that she was knitting was what we would, by today’s standards, call a hit list. 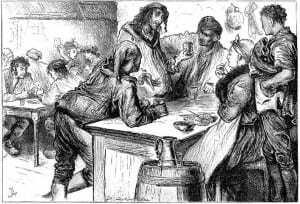 Madame Defarge seated with her knitting in the wine shop. Please consider joining us for a discussion of Calderon de la Barca’s 17th century play “Life is a Dream,” moderated by our very own Professor Cristina Ortiz. The work grapples with questions of free will, fate and metaphysics. Even if you haven’t had a chance to read it, the discussion will be illuminating and educational! The discussion starts at 6:30pm in the second-floor board room at the Brown County Public Library, Downtown Branch, and they are free and open to the public. Associate Professor Hernán Fernández-Meardi will lead a discussion of Paulo Friere’s Pedagogy of the Oppressed as part of Humanistic Studies’ Great Book Series at the Brown County Library on Tuesday, December 8th at 6:30pm. In his critically acclaimed work, Friere advocates for a pedagogy that empowers students as producers of knowledge. Interested readers may find Friere’s book online.